It is a great feeling when an elegant piece of code comes together. Even if it can’t be compiled yet. It is even a better feeling when a code that seems to be impossible to write, starts to work. And the best one – that happens when the code is working so well that you are not afraid of releasing it to the public. Well, make this almost the best. Because there’s something even better – when people call back to tell you that they like using the code and it is helping them to do their work faster and better. I can only respond with: “Rico, thanks!”. 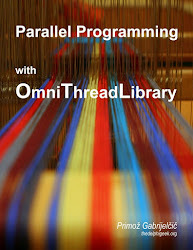 OmniThreadLibrary 1.05 is dedicated to you. As there were no error reports related to OmniThreadLibrary 1.05 RC, I’ve released final 1.05 version just few moments ago. There are almost no changes between the RC and final release – one demo was added and Parallel.Join code was tweaked a little. You can download OTL 1.05 from the Google Code. Alternatively, you can update SVN trunk (checkout instructions) or checkout the release-1.05 tag. Support is available on the web discussion forum. Many internal classes and interfaces was renamed. This should not affect most of the users. I’m sorry for that. Some names are badly chosen and some did not follow the OTL naming conventions. Implemented dynamically allocated, O(1) enqueue and dequeue, threadsafe, lock-free queue. Class TOmniBaseQueue contains base implementation while TOmniQueue adds observer support. Both classes live in the OtlContainers unit. Read more about the TOmniQueue: Dynamic lock-free queue – doing it right. Implemented resource counter with empty state signalling TOmniResourceCount (unit OtlSync). Read more: Three steps to the blocking collection:  Inverse semaphore. New unit OtlCollection which contains blocking collection implementation TOmniBlockingCollection. New high-level parallelism support (unit OtlParallel). Requires at least Delphi 2009. Two parallel control structures are supported: for each (with optional aggregator) and join. The demo for Parallel.ForEach can be found in project 35_ParallelFor. The same code is reprinted near the end of the Three steps to the blocking collection:  Blocking collection post. Parallel.ForEach.Aggregate was described in Parallel.ForEach.Aggreate post and is demoed in project 36_ParallelAggregate. At the moment ForEach is fairly limited. It can iterate over a range of numbers or over a collection supporting the IOmniValueEnumerable interface (TOmniBlockingCollection, for example). The second limitation will be removed in the future. The plan is to support any collection that implements IEnumerable. Parallel.Join is very simple code that executes multiple tasks and waits for their completion. It was designed to execute simple tasks that don’t require communication with the owner. It is demoed in project 37_ParallelJoin. Unit OtlCommon contains new interface IOmniEnvironment and function Environment that returns singleton of this type. Environment can be used to query some basic information on system, process and thread. Some information (for example process and thread affinity) can also be modified using the same interface. New interface IOmniCancellationToken is used in the Parallel.ForLoop (see post Three steps to the blocking collection:  Blocking collection for the example) and in IOmniTaskControl.TerminateWhen. IOmniTaskControl and IOmniTask implement CancellationToken: IOmniCancellationToken property which can be used by the task and task controller. IOmniCancellationToken is just a simple wrapper around the Win32 event primitive and is defined in the OtlSync unit. IOmniTaskControl now implements message dispatching setter in form OnMessage(msgID, handler). Use it to route specific message IDs to specific functions when global TOmniEventMonitor is not used. Implemented IOmniTaskControl.UserData. The application can store any values in this array. It can be accessed via the integer or string index. This storage are can only be access from the task controller side. Access is not thread-safe so you should use it only from one thread or create your own protection mechanism. IOmniTask implements Implementor property which points back to the worker instance (but only if worker is TOmniWorker-based). TOmniTaskFunction now takes 'const' parameter. TOmniTaskFunction = reference to procedure(const task: IOmniTask). TOmniEventMonitor.OnTaskUndeliveredMessage was missing 'message' parameter. Set package names and designtime/runtime type in D2009/D2010 packages. 32_Queue: Stress test for new TOmniBaseQueue and TOmniQueue. 33_BlockingCollection: Stress test for new TOmniBlockingCollection, also demoes the use of Environment to set process affinity. 35_ParallelFor: Parallel tree scan using Parallel.ForEach (Delphi 2009 and newer). 36_ParallelAggregate: Parallel calculations using Parallel.ForEach.Aggregate (Delphi 2009 and newer). Next OTL release is coming soon. Brave souls are invited to download and test 1.05 RC. If you find any problem, make sure to report it in the OmniThreadLibrary forum or here in comments. First there was a good idea with somewhat patchy implementation: Three steps to the blocking collection:  Dynamically allocated queue. Then there was a partial solution, depending on me being able to solve another problem. Still, it was a good solution: Releasing queue memory without the MREW lock. At the end, the final (actually, the original) problem was also solved: Bypassing the ABA problem. Although the dynamic queue has been designed with the OmniThreadLibrary (OTL for short) in mind, there’s also a small sample implementation that doesn’t depend on the OTL: GpLockFreeQueue.pas. This implementation can store int64 elements only (or everything you can cast into 8 bytes) while the OTL implementation from OtlContainers stores TOmniValue data. [The latter being a kind of variant record used inside the OTL to store “anything” from a byte to a string/wide string/object/interface.] Because of that, GpLockFreeQueue implementation is smaller, faster, but slightly more limited. Both are released under the BSD license. Data is stored in slots. Each slot uses 16 bytes and contains byte-size tag, word-size offset and up to 13 bytes of data. The implementation in OtlContainers uses all of those 13 bytes to store TOmniValue while the implementation in GpLockFreeQueue uses only 8 bytes and keeps the rest unused. The following notation is used to represent a slot: [tag|offset|value]. Slots do not stand by themselves; they are allocated in blocks. Default block size if 64 KB (4096 slots) but can be varied from 64 bytes (four slots) to 1 MB (65536 slots). In this article, I’ll be using 5-slot blocks, as they are big enough to demonstrate all the nooks and crannies of the algorithm and small enough to fit in one line of text. The first slot is marked as a Header and has the value field initialized to “number of slots in the block minus one”. [The highest value that can be stored in the header’s value field is 65535; therefore the maximum number of slots in a block is 65536.] This value is atomically decremented each time a slot is dequeued. When the number drops to zero, block can be released. (More on that in: Releasing queue memory without the MREW lock.) InterlockedDecrement, which is used to decrement this value, requires its argument to be 4-aligned and that’s the reason for the value field to be stored first in the slot. The second slot is a Sentinel. Slots from the third onwards are tagged Free and are used to store data. The last slot is tagged EndOfList and is used to link two blocks. All slots have the offset field initialized to the sequence number of the slot – in the Header this value is 0, in the Sentinel 1, and so on up to the EnndOfList with the value set to 4 (number of slots in the block minus 1). This value is used in the Dequeue to calculate the address of the header slot just before the header’s value is decremented. In addition to dynamically allocated (and released) memory blocks, the queue uses head and tail tagged pointers. Both are 8-byte values, consisting of two 4-byte fields – slot and tag. The following notation is used to represent a tagged pointer: [slot|tag]. The slot field contains the address of the current head/tail slot while the tag field contains the tag of the current slot. The motivation behind this scheme is explained in the Bypassing the ABA problem post. Tail and head pointers are modified using 8-byte CAS and Move commands and must therefore be 8-aligned. The memory block begins at address B1 and contains five slots, initialized as described before. The tail pointer points to the second slot of block B1 (B1:1; I’m using the form address:offset), which is tagged Sentinel and the head pointer points to the third block (B1:2), the first Free slot. Here we see the sole reason for the Sentinel – it stands between the tail and the head when the queue is empty. In theory, the enqueue operation is simple. The element is stored in the next available slot and queue head is advanced. In practice, however, multithreading makes things much more complicated. To prevent thread conflicts, each enqueueing thread must first take ownership of the head. It does this by swapping queue head tag from Free to Allocating or from EndOfList to Extending. To prevent ABA problems, both head pointer and head tag are swapped with the same head pointer and new tag in one atomic 8-byte compare-and-swap. Enqueue then does its work and at the end swaps (head pointer, tag) to (next head pointer, Free|EndOfList) which allows other threads to proceed with their enqueue operation. Let’s start with the empty list. Enqueue first swaps [B1:2|Free] with [B1:2|Allocating]. The green colour indicates an atomic change. Only the head tag has changed, the data in the B1 memory block is not modified. Head still points to a slot tagged Free (slot B1:2). This is fine as enqueueing threads don’t take interest in this tag at all. Data is then stored in the slot and its tag is changed to Allocated. This again makes no change to enqueuers as the head slot in the header was not updated yet. It also doesn’t allow the dequeue operation on this slot to proceed because the head is adjacent to the tail, which points to a Sentinel and in this case Dequeue treats the queue as empty (as we’ll see later). Red colour marks “unsafe” modification. At the end, the head is unlocked by storing address of the next slot (first free slot, B1:3) and next slot’s tag (Free). Teal colour marks an atomic 8-byte move used to move new data into the head pointer. If the target platform doesn’t support such move, an 8-byte CAS could be used instead. After those changes, head is pointing to the next free slot and data is stored in the queue. Let’s assume that another Enqueue is called and stores number 17 in the queue. Nothing new happens here. The next Enqueue must do something new as there are no free slots in the current block. To extend the queue, thread first swaps the EndOfList tag with the Extending tag. By doing this, the thread takes ownership of the queue head. A new block gets allocated and initialized (see chapter on memory management, below). Data is stored in the first free slot of the block B2. Last slot of block B1 is modified to point to the first element in the second slot of the next block (Sentinel). Also, a tag BlockPointer is stored into that slot. At the end, the head is updated to point to the first free slot (B2:3). That completes the Enqueue. List head is now unlocked. The actual code is not more complicated than this description (code taken from GpLockFreeQueue). Read the data (tail doesn’t catch the head). Read the data (tail does catch the head). To prevent thread conflicts, dequeueing thread takes ownership of the tail. It does this by swapping the tail tag from Allocated or Sentinel to Removing or from BlockPointer to Destroying. Again, those changes are done atomically by swapping both tail pointer and tail tag in one go. Let’s walk through all five scenarios now. Let’s start with a queue state where two slots are allocated and head points to the EndOfList slot. The code first locks the tail. As there is no data in the Sentinel slot, the tail is immediately updated to point to the next slot. There’s no need to update the tag in slot 1 as no other thread can reach it again. Because the slot is now unreachable, the code now decrements the count in the B1’s Header slot (from 4 to 3). Because the original tag was Sentinel, the code retries from beginning immediately. The queue is now in scenario 2 (data, the tail is not immediately before the head). Again, the tail is locked. The code then reads the value from the slot (42) and advances the tail to the slot B1:3. Again, there is no need to change the slot tag. The slot 2 is now unreachable and the Header count is decremented. The code has retrieved the data and can now return from the Dequeue method. If the Dequeue is now called for the second time, we have the scenario 3 – there is data in the queue, but the head pointer is next to the tail pointer. Because of the, the tail cannot be incremented. Instead of that, the code replaces the tail slot tag with the Sentinel. It is entirely possible that the head will change the very next moment which means that the Sentinel would not be really needed. Luckily, that doesn’t hurt much – the next Dequeue would skip the Sentinel, retry and fetch the next element from the queue. The code starts in a well-known manner, by taking ownership of the tail. The code then reads the value from the slot, but because the head was next to tail when Dequeue was called, the code doesn’t increment the tail and doesn’t decrement the Header counter. Instead of that, the Sentinel tag is put into the head tag. It doesn’t matter that the slot tag is still Allocated as no-one will read it again. If the Dequeue would be called now, it would return immediately with status empty because the tail tag is Sentinel and because the tail has caught the head. In the last scenario, the tail is pointing to a BlockPointer. As expected, the code first takes the ownership of the tail. We know that the first slot in the next block is Sentinel. We also know that the head is not pointing to this slot because that’s how Enqueue works (when new block is allocated, head points to the first slot after the Sentinel.). Therefore, it is safe to update the tail to point to the Sentinel slot of the B2 block. By doing the swap, the ownership of the tail is released. The Header count is then decremented. Because the count is now zero, the code destroys the B1 block. (Note that the Header count decrement is atomic and only one thread can actually reach the zero.) While the block is being destroyed, other threads may be calling Dequeue. Because the tail tag was originally BlockPointer, the code retries immediately and continues with the scenario 1. The actual code is tricky because some of the code path is shared between scenarios (code taken from GpLockFreeQueue). In the dynamic queue described above, special consideration goes to memory allocation and deallocation because most of the time that will be the slowest part of the enqueue/dequeue. Memory is always released after the queue tail is unlocked. That way, other threads may dequeue from the same queue while the thread is releasing the memory. The allocation is trickier, because the Enqueue only knows that it will need the memory after the head is locked. The trick here is to use one preallocated memory block which is reused inside the Enqueue. This is much faster than calling the allocator. After the head is unlocked, Enqueue preallocates next block of memory. This will slow down the current thread, but will not block other threads from enqueueing into the same queue. Dequeue also tries to help with that. If the preallocated block is not present when a block must be released, Dequeue will store the released block away for the next Enqueue to use. Also, there's one such block preallocated when the queue is initially created. If this explanation is unclear, look at the program flow below. It describes the code flow through the Enqueue that has to allocate a memory block and through the Dequeue that has to release a memory block. Identifiers in parenthesis represent methods listed below. All manipulations with the cached block are done atomically. All allocations are optimistic – if the preallocated block is empty, new memory block is allocated, partitioned and only then the code tries to swap it into the preallocated block variable. If compare-and-swap fails at this point, other thread went through the same routine, just slightly faster, and the allocated (and partitioned) block is thrown away. Looks like there may be quite some work done in vain but in reality the preallocated block is rarely thrown away. It tested other, more complicated schemes (for example small 4-slot stack) but they invariably behaved worse than this simple approach. As you can see in the code fragments above, memory is also initialized (formatted into slots) when memory is allocated. This also helps with the general performance. Tests were again performed using the 32_Queue project in the Tests branch of the OTL tree. All in all this results in 2 million reads and 2 million writes distributed over three queues. Tests are very brutal as all threads are just hammering on the queues, doing nothing else. The table below contains average, min and max time of 5 runs on a 2.67 GHz computer with two 4-core CPUs. Data from the current implementation ("new code") is compared to the original implementation ("old code"). Best times are marked green. The new implementation is faster when less threads are used and slightly slower when number of threads increases. The best thing is that there is no weird speed drop in N = 1, M = 7 case. The small slowdown with higher number of threads doesn't bother me much as this test case really stresses the queue. In all practical applications, there should be much more code that does real work and queue load would rapidly drop down. If your code depends on accessing a shared queue from many multiple threads that enqueue/dequeue most of the time, there's a simple solution - change the code! I believe that multithreaded code should not fight for each data, but cooperate. A possible solution is to split the data in packets and schedule packets to the shared queue. Each thread would then dequeue one packet and process all data stored within. The code will be released in OmniThreadLibrary 1.5 (but you can use it already if you fetch the HEAD from the SVN). It passed very rigorous stress test and I believe it is working. If you find any problems, please let me know. I’m also interested in any ports to different languages (a C version would be nice). Anyway, I got submerged into music and half of my brain switched of and then I got all sorts of weird programming ideas. The first was how to solve the ABA problem in the initial dynamic queue implementation. [Total failure, that idea, it didn’t work at all.] The second, however, proved to be very useful as it solved the memory release problem (provided that ABA gets fixed, of course). The problem with the initial implementation was that the head/tail pointer and corresponding tag were access asynchronously. In the multithreading environment, that is always a problem. Somehow I had to modify them at the same time, but that didn’t look feasible as the tag was living in the dynamically allocated block and the head/tail pointer was stored in the object itself. I couldn’t put the head/tail into the block, but I could put a tag near to the head/tail pointer! [A copy of the tag, actually, as I still needed the tags to be stored in the data block.] Then I could use 8-byte compare-and-swap to change both the pointer and the tag at the same time! Still, there is a simple (at least for some values of that word) solution to such problems – introduce the sentinel. This is a special element signifying that some pointer (tail, in my case) has reached the end of list. A good idea, but could it be made to work? I fired up my trusty spreadsheed (very good stuff for simulations) and in few hours I had the basic plan laid out. It was a really simple work to convert this to the code. After fixing few bugs, I had the new queue running, faster then ever before! I’ll put together a long article describing all the tricks inside the new dynamic queue, but that will take some time, sorry. In the meantime, you can checkout the current OtlContainers and read the pseudo-code documentation.